Grant is a storehouse of useful vitamins and substances. It not only stimulates the production of hemoglobin, but also affects the entire digestive system. About the miraculous power of this fruit is legendary, some of them quite justified. It should be noted that garnets come in many varieties, sizes, colors them also varies quite markedly. However, almost all the fruits that come to us, differ in their cost, so they are not frequent guests at our tables. Many questions still caused by the fact that the pomegranate is very difficult. Lots of berries with seeds inside the dense shell cause a lot of issues. How to clean, how to eat and how to bring to the table? All this sometimes puts Housewives before a difficult choice to buy grenades or not. To eat pomegranate, it must be convenient to feed. As it turned out, not all idea how to clean it. 1. Take the pomegranate, carefully wash and dry. 2. With a sharp knife cut off the butts from both ends of the pomegranate. Try to cut so as not to damage the berries. 3. Then you need a sharp knife to make a shallow incision. It requires special skills, because to touch the berries need. Start the cut from the edge of one of the tops cut along the spiral to the other. Spiral should be on the opposite slice. 4. Now grasp the edges of pomegranate and expand the spiral. Grenades will be deployed in the strip, and the berries will lie in neat pyramids. 5. Select berries on a plate and so serve. So they will be much more convenient to get it and then not put the plate. Disputes about can you eat pomegranate with seeds or not, still relevant today. Some say that the seeds of pomegranate contain up to 50% of nutrients around the grenade. Others believe that this is a tough fiber, and it can cause problems with digestion. 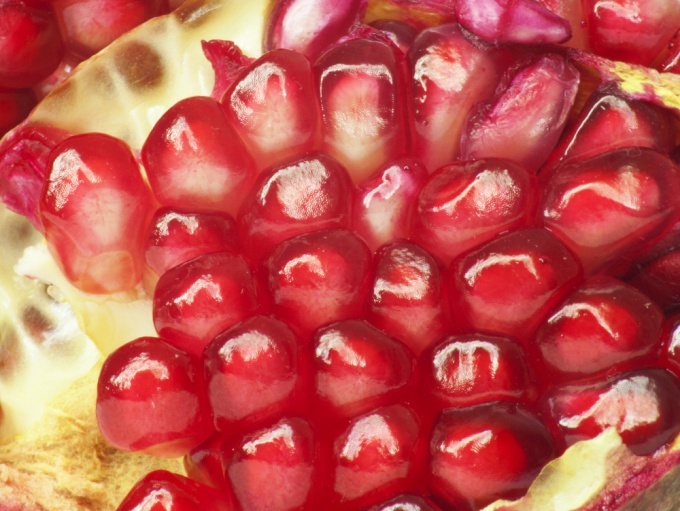 One of the easiest ways you eat pomegranate is to squeeze the juice and drink it. Those who are not lazy, you have to offer, there are grenades, spitting out the bones. However, at the festive table, it will not be very appropriate, therefore, consider the nuances in advance. It is only clear that grenades are needed and necessary. Ensure that your children eat pomegranates. If we are talking about kids, give them one hundred grams of pomegranate juice. Just squeeze the juice yourself, because canned juice, may contain a greater amount of impurities. Stay healthy and Bon appetit.